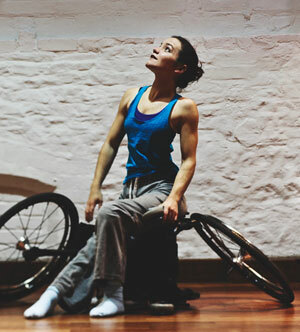 This one-day course, led by Laura Jones and Chris Pavia from Stopgap Dance Company will explore the ways in which disabled and non-disabled dance leaders can establish equal working partnerships that build on the strengths of both partners in order to deliver co-led dance sessions. •	Devising, evaluation and feedback. This course is open to any dance practitioner. Participants applying as a pre-identified disabled/non-disabled partnership will be given priority booking for this course. Since joining Stopgap in 2001, Laura Jones has been integral to the growth and direction of the company and is a fierce advocate for the dance and disability sector, speaking at events such as Move it! and the Dance UK : The Future conference. Laura started her training at Linda Butler School of Dance. Having sustained a spinal injury in 1998, Laura went on to become the first wheelchair user to complete 100% of the A-Level dance syllabus. Since then she has worked with numerous choreographers including Yoshifumi Inao (Batsheva Dance Company) Caroline Bowditch, Kevin Finnan (Motionhouse) Thomas Noone (Thomas Noone Dance) Rob Tanion (Stan Won’t Dance/DV8), Gary Clarke (Pit Fleur/ Fetherstoneshaughs), Bettina Strickler (Protein) Nathalie Pernette (Compagnie Pernette), Filip Van Huffel (Retina) and Adam Benjamin, touring their work nationally and internationally. Laura’s extensive teaching experience ranges across all ages and abilities throughout the UK as well as many projects across Europe, including for Mixed Ability Dance EU in Romania and Albania, 2010, and in Berlin for People Moving 2006 and Tanzfabric, 2012. Laura worked as a Dance Captain for the Opening Ceremony of the London 2012 Paralympic Games, assisting with the choreography of all dance sections, teaching the 3500 volunteers and performing in the ceremony itself. Laura’s own creation credits include A:Version for Resolution! (2009) and directing and editing the dance film Re:Bound.(2004). She also presents the live online streaming for various Dance UK events. Laura has collaborated with Stopgap on Triple Bill, Double Booked, Portfolio Collection, Tracking, Trespass, SPUN Productions, Artificial Things and The Seafarers. Laura was Interim Artistic Director of Stopgap in 2016 and in 2018 while Lucy Bennett was on maternity leave, and became Head of Talent Development in 2017.